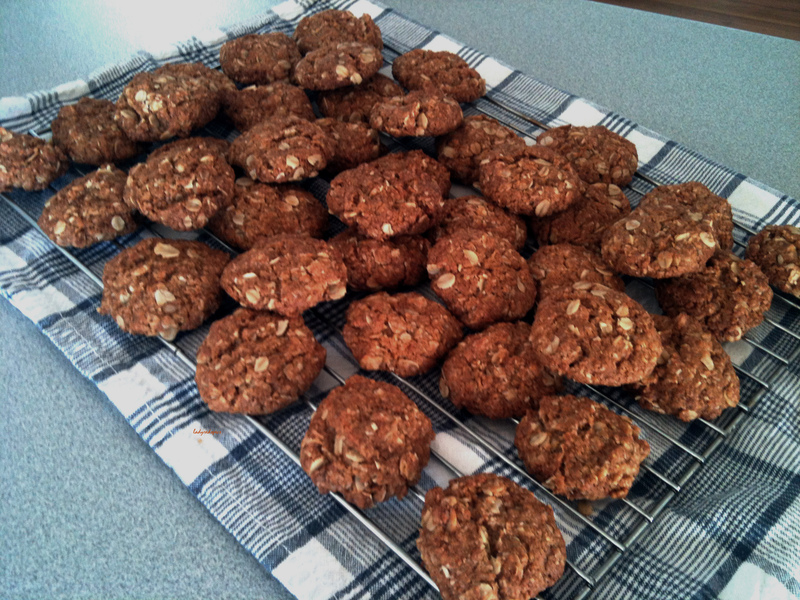 ANZAC BISCUITS (Cookies) are known and loved by every baby boomer Aussie and Kiwi alike. It is a commonly held belief that they were named because the mothers and wives of ANZAC servicemen would bake them during WW2 and send them to the front. They are cheap to make, robust enough not to break and keep well. They are great to dunked into a cup of tea if baked hard, but also have a strong following if soft and chewy. All ways, they are a family winner and the dough simple enough for the kids to make. Anzacs have never lost their popularity and even though they now available commercially, I think they are so much better home made.Anzacs can also be made as a great wheat free and dairy free treat. This is my Mum’s recipe for Anzac Biscuits. In a small saucepan warm the butter and golden syrup until the butter has melted. In a small bowl, combine the boiling water and bicarbonate of soda. Add the bicarbonate of soda and water mixture to the melted butter and golden syrup, then pour into the bowl of dry ingredients. Mix thoroughly. Dollop teaspoonfuls of the biscuit mixture onto the greased baking tray. Don’t forget that the biscuits WILL spread a little during baking, so make sure you leave room. Remove from oven, allow the Anzac biscuits to cool on the tray for a few minutes then move to a cooling wire. Store in an airtight container. ANZACS can also be make a great WHEAT FREE AND DAIRY FREE TREAT. This entry was posted on April 12, 2012 by ladyredspecs in Baking, Cookies, sweet biscuits, Food, Sweet mouthfuls and tagged biscuits, cookies, gluten free, lactose free, oats.